Important Shower Glass Design Elements - Rocklin Glass & Mirror, Inc. Rocklin Glass & Mirror, Inc. 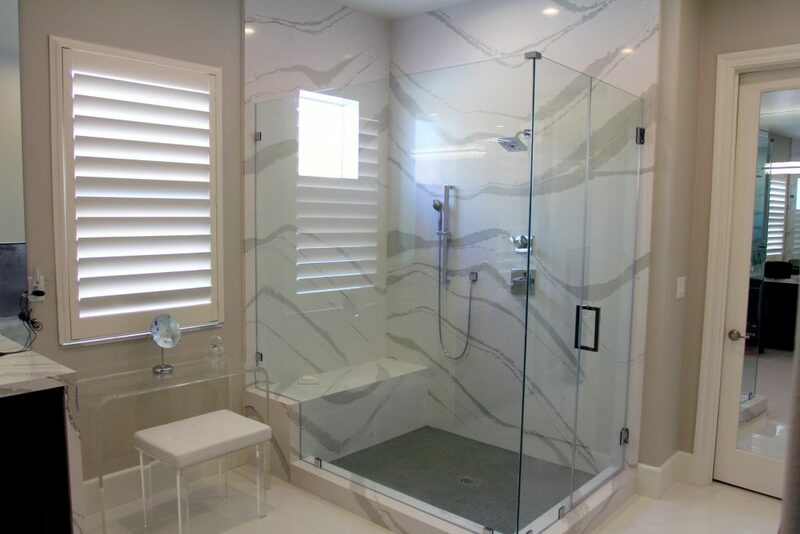 Important Shower Glass Design Elements - Rocklin Glass & Mirror, Inc.
As a rule of thumb, typically a stationary shower panel glass is ½” thick; however, if it’s door that opens and closes, it’s best to use 3/8” glass (which is standard for Frameless Showers). In some instances, ½” will be more suitable depending on how the glass adheres to an adjacent wall. It’s not about making a shower door thinner but making the panel thicker. Custom shower door glass relies on hinges strong enough to support ½” glass. But when 3/8” glass is used for a door you will find the hinges will operate better, easier and typically last longer. Why? It’s because the hinge isn’t as burdened with weight to their maximum limitations. Shower glass is tempered, given its safety value. Tempering is done by heating the glass to a softening temperature and then quickly chilling it with cold air. The process produces a highly desirable condition of induced stress and results in additional strength. Tempered makes the glass stronger with resistance to thermal stress and impact resistance. Tempered glass, if it breaks, will break into a million tiny little oval pieces. If a custom shower is built properly and RIGHT from the beginning to end, it will be safer and last longer no matter how often or not the shower is used daily. Choosing decorative accents can add appeal and flare to any shower installed. You can pick your towel bar, if you desire one. You choose the handle, types of hinges either square or beveled; and clips. These come in a variety of finishes, such as: Chrome, Brushed Nickel, Oil Rubbed Bronze, Matte Black, and some others. When renovating your existing bathroom shower or shower panel, or starting from scratch, best bet is to reach out to the professional shower door installer, such as Rocklin Glass & Mirror, Inc. Rather than selecting hit or miss pieces on your own. You’ll have a peace of mind experience knowing your shower glass door thickness and other elements of design are not only aesthetically beautiful, but safe! Each manufacturer for framed showers has their own specific parts. SHOWER PARTS ARE NOT UNIVERSAL. If your shower part(s) break, we recommend that you DO NOT TOSS the part(s)! Do not throw anything away until we are able to look at the parts and determine whether they can be fixed, re-usable or must be ordered. 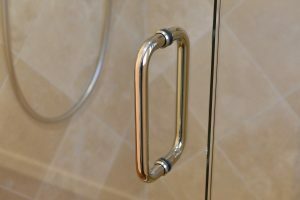 Replacing seals on hinged or pivoting frameless shower glass doors, the bottom seal – aka a door sweep or door wipe – keeps the water inside when the door is closed, and wipes water into the shower when the door is open. This plastic sweep will wear and tear over time; and will harden, brittle or discolor. When this happens a complete seal, replacement is necessary to retain sealing effectiveness. A worn and damaged shower door seal will leak water. Bring your existing sweep into the shop. Or, find the dimensions necessary for a replacement sweep. You will need to bring us the thickness; the width necessary to fit the opening and we can cut a new sweep for you.